The price of bitcoin has gone parabolic in the past few weeks, creating and smashing countless new all-time highs along the way. Trading began today at $4,111.35 (GMT 00:05), and after less than 6 hours elapsed, the daily low was realized at $3,966.50 (GMT 05:55). The remainder of the day saw an upswing in market activity, that eventually secured a new $4,328 Bitstamp all-time high (GMT 17:00). Mainstream media has been heavily covering the break above $4,000, most of the articles and corresponding coverage has been highly bullish. Prominent sources such as Forbes, CNBC, the Wall Street Journal, and Business Insider have all fully covered the fanfare pertaining to the milestone event. The total crypto currency market cap has ballooned to $140 billion, with bitcoin now conferring to a larger chunk of that pie at $70 billion (more than 50% at the time of writing). The remainder is split up between ethereum at $28 billion, ripple which is holding at $6.5 billion, bitcoin cash at a valuation that is slightly below $5 billion, as well as other alternative crypto currencies and assets. In the meantime, segwit has locked in and has entered its activation period. Completion is expected by August 22, if the existing momentum and speed in block generation stays constant. Interestingly, bitcoin is as of this moment, worth more than Paypal, at least when it comes to market capitalization. An actual detailed article comparing both, that would factor in existing global circumstances, along with comprehensively explained causes for the anomaly, appears to be lacking at present. Startups in the fintech industry are rapidly taking away business from the ageing banking sector. Disruptions of the old paradigms are rampant, proving that innovation and flexibility may be needed, if the exhausted banking giants and conglomerates are to survive. Exotic predictions are plentiful as well, and certain social media figures are citing the top of this run-up at $5,000, with some even stating $10,000 as a reasonable target. History is being revisited due to the unfolding events, comparisons are being drawn to the dot-com bubble, and the 2008 pre-crash period too. There are other numerous examples that could serve as a cautionary reminder; Silver Thursday comes to mind, as does the infamous tulip mania. Trading began on August 9 at the $3,178.72 weekly low (GMT 10:00), before a meteoric rise in price stopped out at today’s currently unbroken $4,328 all-time high (GMT 17:00). 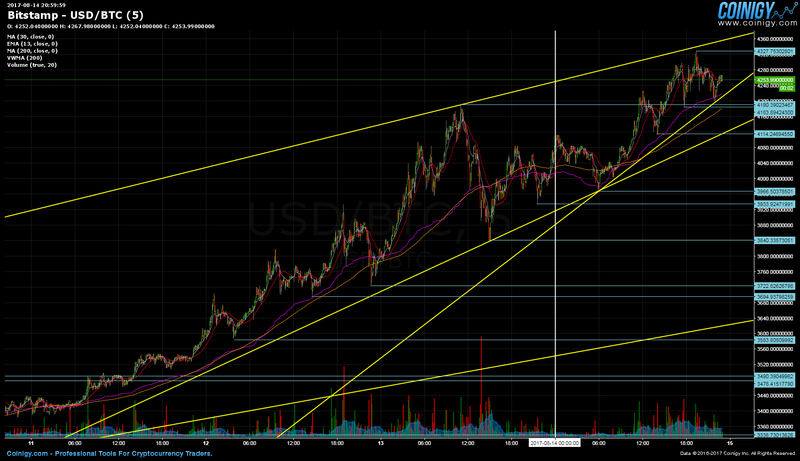 Since then, oscillations have been minor, and a rising ascending wedge has formed.